Most enterprises defences are externally-facing, focused on stopping incoming email and web attacks. But, once attackers gain a foothold inside the network through malware, there are very few security controls that would prevent the spread of the attack between enterprise locations in the Wide Area Network (WAN). This is partly due to the way enterprises deploy security tools, such as IPS appliances, and the effort needed to maintain those tools across multiple locations. It’s for those reasons Cato Networks recently introduced a context-aware Intrusion Prevention System (IPS) as part of its secure SD-WAN service. There are several highlights in this announcement that challenge the basic concept of how IT security maintains an IPS device and sustains the effectiveness of its protection. Cato Networks is a cloud-based, SD-WAN service provider that uniquely integrates network security into its SD-WAN offering. 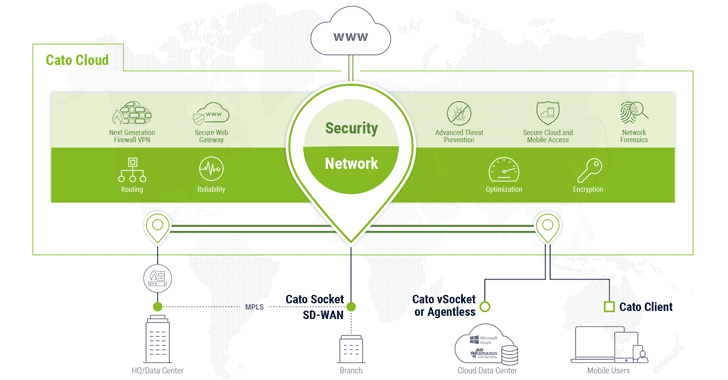 The Cato IPS is fully converged with Cato’s other security services, which include next generation firewall (NGFW), secure web gateway (SWG), URL filtering, and malware protection. With the IPS roll out, Cato continues its march towards providing secure networking everywhere while simplifying the overall IT stack for the enterprise. With IPS as a service, Cato takes care of the work previously spent managing and maintaining the IPS appliances including sizing, capacity planning, patching, and signature management. These are a complex task because IPS appliance performance is impacted by the mix of encrypted and unencrypted traffic and the number of active attack signatures. Normally, IT professionals must spend time carefully calculating the effectiveness of a signature and its performance impact to avoid slowing-down traffic due to IPS appliance overload. Cato addresses both issues. The Cato IPS leverages its elastic cloud platform to inspect any mix of encrypted and unencrypted traffic in real-time. The decision of which signatures to deploy is made by the experts of Cato Research Labs. They consider the relevancy of the threat and the best way to describe it to the system. Often, an existing signature may already cover a specific attack vector. The Cato IPS has another unique capability. Because it operates in the same software stack as all other network and security services and within a cloud network, it can access a rich set of context attributes. This forms a foundation for very sophisticated signatures that are hard to compose with stand-alone IPS devices. The use of rich context makes Cato IPS signatures more accurate and more effective. Context attributes include the application being accessed and the client being used to access it, user identity, geolocation, IP and domain reputation, the file type exchanged, and DNS activity associated with the session. Cato shared on its blog how Cato IPS stopped the spread of the Wannacry ransomware across sites, and how Cato IPS detected command-and-control communication at one of its customer locations. Interestingly, the IPS can extend its protection across sites and users without the need to deploy distributed appliances, another benefit of the system. If you are a distributed enterprise and constraint by your ability to support a complex networking and security environment, Cato’s approach can improve your security posture while keeping overhead to a minimum. Disclosure: This is a sponsored post from Cato Networks, and it is really coming at a great time because we were just thinking to share with you about how to prevent Wannacry like attacks from spreading across the enterprise networks.